Ice rental fees were $33.50 per hour. 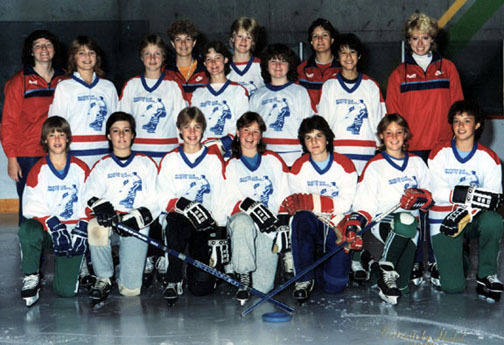 "A"(Rep) Level Committee was established in May of 1984 and was Chaired by Hugh Stepaniuk. 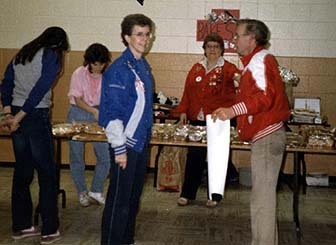 Other committee members were: Jim Brodie, Ray Lee, Arnold Thompson, Frances Willis, Bob Veale, Mardelle Boutin. 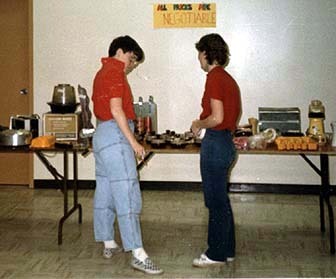 "A" Tryouts were held in September of 1984, with 24 Belles, 30 Junior Belles and 14 Debs. 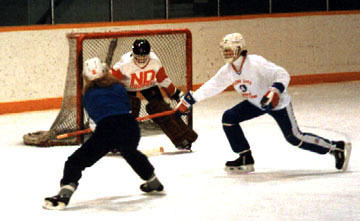 Ringette Canada held a National Leadership Development Seminar in July of 1984. Carmen Bell was sponsored by Ringette Calgary to attend. 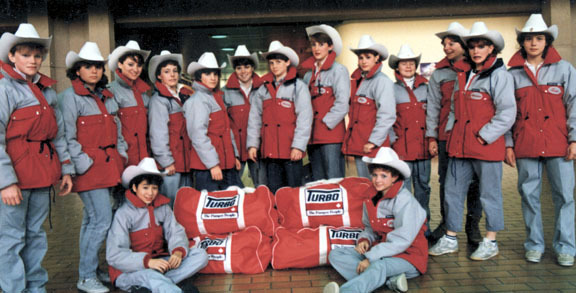 Ringette display was done in conjunction with the Wranglers Hockey Team Sport Swap held at the Stampede Corral. 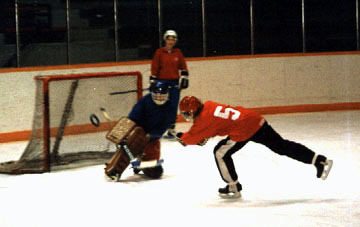 Booths promoting Ringette were set up at several Calgary Malls. 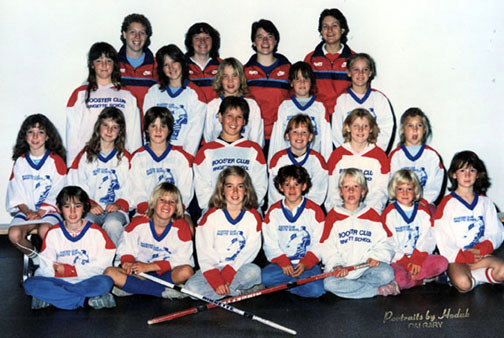 The Ringette promotional brochure was placed in Welcome Wagon packages. For the first time, the Junior “A” team participated in the Belle houseleage. Two Referee clinics were held - a “Regional” level and a “Community” level. Coaches clinics were held both Level I Technical and Level II Technical. 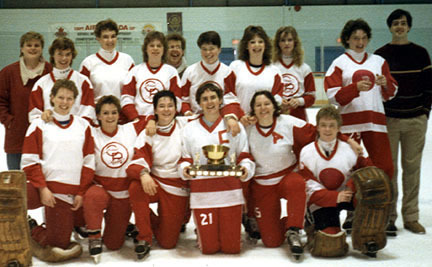 Provincial Championships were held March 1-3, 1985 in Sherwood Park. The Calgary Debs won Provincials and went to Dollard des Ormeaux, Quebec (Montreal) to Nationals. 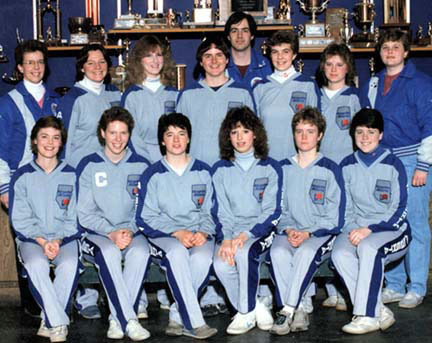 Back: Mardelle Boutin, Beth Little, Cara Brown, Linda Tippin, Bob Veale, Jackie Willis, Leanne Henderson, Laura Webb. The Calgary Deb Rep Team won provincials, and then reality set in and they came to the conclusion that they had no money to go to Montreal to Nationals..... Most of the players were students and everyone worked hard to generate some funds to help with expenses. 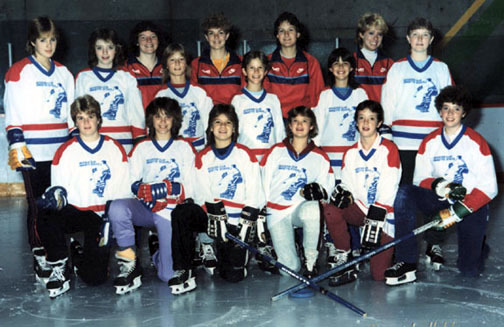 There was no financial support available from Ringette Calgary or Ringette Alberta at that time. 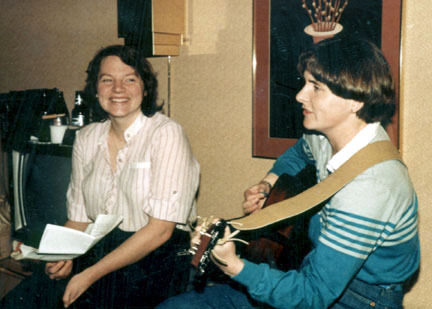 BUT, once the team got to Montreal the entertainment was cheap.